Fruit trees for sale | Pear Fruit Trees. Any Bare Root Pear fruit trees - Availability means available for supply from Nov to May. 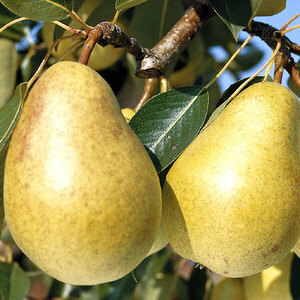 Any Container grown Pear fruit trees - Availability means available for supply now. Rootstocks come in 5 sizes (2 for Pear trees QC and QA) see the chart below, all of our fruit trees are labelled using these codes. Bare Root = Field grown trees that have been freshly lifted and supplied with no soil around the roots. Only available during the dormant period November-April. 1 Year Maiden = A one year old tree and the size depends on the variety but in general they will be around 100cm in height and mainly just whips. Most suburban situations provide good pollen due to the close proximity of other gardens. It is not always necessary to have pollinators if the bees and other pollinating insects are generous with their visits. If you have no other Pear tree close by then select two varieties in the same group or the adjoining group ie group B and D will pollinate group C as will any others in group C. Some varieties are self fertile. Pears need a location with good circulation where the ground is slightly elevated and sloping. This is because the trees bloom early and the flowers may be damaged in the spring by frosty air, which settles in low-lying areas. Pears should be grown in heavier soil types such as clayey loam with porous subsoil, or medium or sandy loam. Pear trees will not survive on ground that is saturated with water. Delivery Charges - The delivery charge is worked out from the weight and the size of the plant. We have several rates that apply to UK mainland addresses. A delivery charge of £8.50 is for all single tree orders. £10.00 if more than one tree except in the case of the Espalier Fans and Step Over trained trees where this charge is a maximum of £40.00. Dessert/Culinary Pear Improved Fertility fruit trees - Hardy and heavy cropper. The medium sized fruits are very sweet and juicy for dessert, with an excellent, melting texture. It is self fertile but a nearby pollination partner will ensure a better crop. Disease resistance is good. Picking time September. Pollination group C.
Lovely bushy tree. Great service again. Thanks.